Keystone/Getty ImagesIt was August 6, 1945 and the United States was involved with World War Two on two fronts, in Europe and also in the South Pacific. Supplies were waning with fighting going on in two different parts of the world at the same time. So the decision was made by then President Harry Truman to utilize an atomic bomb for the first time ever. With that order, the United States prepared a B-29 Super Fortress call the “Enola Gay” to drop a 10 foot atomic bomb called “Little Boy” on Hiroshima, Japan. What happened on that day changed the world and basically brought the conflict in the South Pacific to an end. 140-thousand people died from that bomb. It was the first use of a nuclear weapon in warfare. It wiped out four square miles of Hiroshima. Three days later another atomic bomb was dropped on Nagasaki, Japan leading to the Japanese surrender. 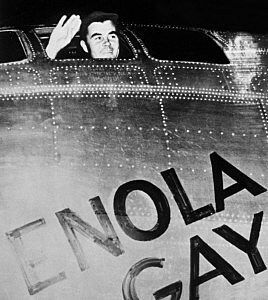 The pilot of the Enola Gay was Quincy, Illinois native Paul Warfield Tibbets, Jr. who was a Brigadier General in the United States Air Force. Tibbets was born in Quincy on February 23rd, 1915 and passed away on November 1, 2007. He was the son of Paul Warfield Tibbets,Sr. and Enola Gay Haggert Tibbets, hence the name of the aircraft. Little did Paul Tibbets, Jr. think growing up as a kid that he would play such a huge role in history later in his life. He certainly had no idea on this date 68 years ago that what he was about to do would change the world. He is Quincy’s major tie to World War Two and a tie that led to the end of World War Two.